We advice caution when travelling to Bangladesh. 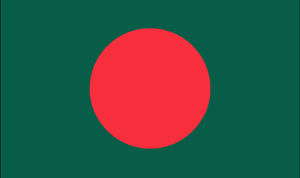 Bangladesh is a country in Asia (Southern Asia) with around 154 million citizens and a land mass of 144,000 km². We detected travel advisories from 6 sources for this country. Bangladesh shares land borders with India and Myanmar. For these countries, the individual warning index is 2.7 (India) and 2.2 (Myanmar). See danger map of the region. Exercise increased caution elsewhere in Bangladesh due to the threat of terrorism and uncertain security situation. Avoid non-essential travel to Dhaka and the Chittagong Hill Tracts region due to the threat of terrorism and uncertain security situation. The Ministry for Foreign Affairs and Trade Promotion advises Maltese nationals travelling to Bangladesh to exercise a high degree of caution, in view of the long history of political violence in the country. In cases of political unrest, incidents of arson, violence and vandalism can suddenly break out across the country, mainly in towns and cities. Hence, it is essential that travellers evade large gatherings and mass meetings, follow the advice of local authorities at all times and keep up-to-date with ongoing developments by monitoring the media. We've reviewed our travel advice for Bangladesh. We haven’t changed our level of advice - ‘reconsider your need to travel’ to Bangladesh.